Add a comfortable and understated design to the dining or bar area in your home with this classy seven piece counter height table and chairs set. 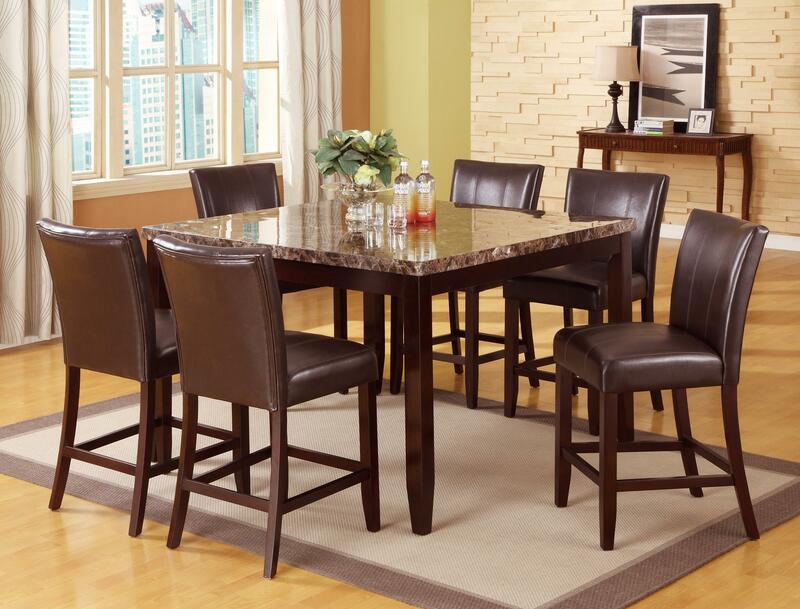 Featuring a warm dark brown finish with six plush upholstered counter height side chairs, as well as a square leg table with faux stone top, this grouping is as functional as it is fashionable in design. Add a gathering space to your home that will last for years to come, with this smart dining set. The Ferrara 7 Piece Pub Table and Counter Height Chairs Set by Crown Mark at Sam Levitz Furniture in the Tucson, Oro Valley, Marana, Vail, and Green Valley, AZ area. Product availability may vary. Contact us for the most current availability on this product. Finish Rich and dark brown wood finish. Case Detail Block legs with clean straight edges and slightly tapered bases. Description: Top Faux stone laminate table tops on all pieces. The Ferrara table collection is an understated yet stately grouping of tables that are designed to outfit a multitude of rooms in your home. 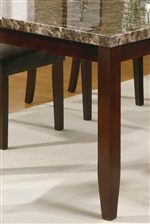 Whether it be your home bar, dining room, or living room, this grouping has a faux stone top table with block legs and a rich dark brown finish to accommodate the furniture needs of your room. Sturdy and smart these tables reflect classy style with no frills, making the Ferrara collection a lasting design choice for your home. The Ferrara collection is a great option if you are looking for Traditional furniture in the Tucson, Oro Valley, Marana, Vail, and Green Valley, AZ area. Browse other items in the Ferrara collection from Sam Levitz Furniture in the Tucson, Oro Valley, Marana, Vail, and Green Valley, AZ area.